Pebble Notifier (Android): Now even better! I learned today that Pebble Notifier has been updated to version 2.5. Among other improvements, it now attempts to send even more information to Pebble than just notification text. Example: With Carbon for Twitter included in my Pebble Notifier list it now sends both the notification and if I scroll down when the notification appears on my Pebble, the @mention text is also displayed. Cool! I already love my Pebble (see my initial impressions). It’s fun seeing Pebble functionality evolve via third-party developers! 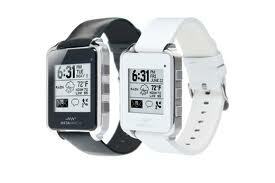 In April 2012, I contributed to a kickstarter project for the Pebble watch. It was a new product that would allow the wearer to link the watch to their iOS or android phone and receive a variety of notifications. Because the watch face itself is software based, the user could select from different watch faces rather than having just one standard display. Fast forward to February 2013: My Pebble watch arrived yesterday! While email notifications work well using the native Pebble android app, I found them distracting and turned them off. Note to Gmail two-step authentication users: You’ll need to set up an app-specific password in order to receive Gmail on your Pebble watch. I’d love to see a battery % status display on the watch (or within the Pebble android app). Even so, I love my Pebble and look forward to seeing additional functionality and integration enabled as developers get up and rolling. Edited to add: Here’s a good video by The Verge that shows Pebble watch in use.